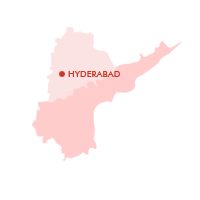 Andhra Pradesh (AP) is located in the Southern peninsula of India. The state of is bound by Chhattisgarh on the north, Odisha on the northeast, Telangana and Karnataka on the west, Tamil Nadu on the south, and the Bay of Bengal on the east. 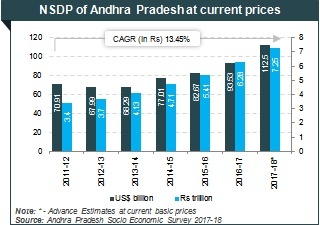 The erstwhile state of Andhra Pradesh has been bifurcated into two states, Telangana and residuary Andhra Pradesh (Seemandhra), by the Andhra Pradesh Reorganisation Act, 2014 or the Telangana Act. The act consisted of the aspects of division of assets and liabilities, the boundaries of the proposed new states and status of the capital city Hyderabad after the separation of the state. The state has well-developed social, physical and industrial infrastructure and virtual connectivity. It also has good power, airport, IT and port infrastructure. 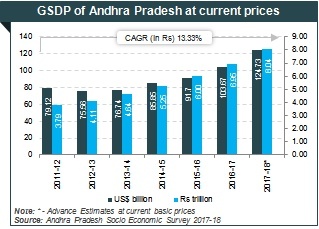 At current prices, Andhra Pradesh’s Gross State Domestic Product (GSDP) was estimated at US$ 124.73 billion in 2017-18AE. Between 2011-12 and 2017-18AE, the average annual GSDP growth rate was 13.33 per cent*. The state has attracted Foreign Direct Investment (FDI) equity inflows worth US$ 16.487 billion during the period April 2000 to June 2018, according to data released by Department of Industrial Policy and Promotion (DIPP). As of July 2018, the state had 19 operational SEZs across diversified sectors which include textiles and apparel, food processing, footwear and leather products, multi-product, pharma, IT SEZs etc. Seemandhra, comprising Rayalaseema and coastal Andhra, has most of the power projects of undivided Andhra Pradesh. Coal-based power plants are mostly located in the state due to proximity to the ports. As of October 2018, Andhra Pradesh had a total installed power generation capacity of 23,674.17 MW. It is the first state in the country to have enacted the Industrial Single Window Clearance. The Act made it compulsory for new industries to register with the single-window to obtain clearances quickly. It also simplified procedures for getting industrial clearances. The state also has separate acts for development in sectors such as solar power, electronic hardware and food processing. The state has a large coast line of nearly 974 kms, temple destinations, lush green forests and spicy cuisine which have led to increase in domestic tourism in the last few years. Andhra Pradesh is one of the largest producers of brackish water shrimps and freshwater prawns. In August 2018, Chinese phone components maker Holitech Technology Company decided to invest Rs 1,400 crore (US$ 200 million) for setting up of a facility which will manufacture five types of smartphone components exclusively for Xiaomi India. Government of India has given ‘in-principle approval’ for setting up of a greenfield airport at Kurnool. The airport, dubbed Orvakal Airport, will be built with an investment of US$ 34.6 million and will have capacity of 1.45 million passengers per annum. The construction of the airport is expected to be completed by December 2018. The airport is expected to be unveiled by January 2019. Production of crude oil and natural gas in the state was recorded to 295 thousand metric tonnes and 842 mcm during April 2017-February 2018, respectively. Oil major Indian Oil is planning to invest Rs 827 crore (US$ 128.32 million) in Andhra Pradesh. Out of the total investment, Rs 500 crore (US$ 77.58 million) will be used to set up a state-of-the-art oil terminal in Nalgonda. Andhra Pradesh is home to many global and national pharma players and various companies have set up their manufacturing hubs in different cities of the state. Exports of pharmaceuticals^ from the state stood at US$ 1.41 billion in FY18 and reached US$ 752.99 million in FY19 (up to September 2018). The presence of rich climatic and soil conditions make Andhra Pradesh a major agricultural belt. Few of the leading crops produced in the state include rice, chilly, oilseeds, cotton, pulses and gram. Moreover, the state is also home to a thriving fisheries industry and ranks first in the production of fish and shrimp in India and contributes more than 70 per cent of the country’s cultures shrimp production. According to the Director General of Hydrocarbons (DGH), Andhra Pradesh has huge oil & natural gas reserves. The state’s Krishna-Godavari basin, spread over an area of nearly 52,000 sq km, has a total hydrocarbon resource base of 1,130 million metric tonnes. To promote investments in the industry, Andhra Pradesh Petroleum, Chemicals & Petrochemicals Investment Region (PCPIR) is being set up. Andhra Pradesh is known for its pristine beaches, sacred places of worship, lush green forests, spicy cuisine & hospitable people.